Access via Stanton Fitzwarren, off the A361 towards Highworth. Now the light evenings are here, what better than a sunset walk in one of Swindon's fantastic parks and gardens? Stanton Park (est. 2000) is Swindon's newest park and is a haven for wildlife, comprising 185 acres of sweeping pastures and meadows, semi-natural woodland and the large Stanton lake. Its Great Wood, with mainly native species of Oak, Ash and Hazel, has existed for over 400 years and is an excellent habitat for birds, insects, fungi and mammals - including bats! Expect also to see sheep and lambs (in early Spring), ducks and swans - and plenty of other dogs enjoying a walk. Fishing on the Lake is available with a valid license, which can be obtained from the Coleview Community Centre (Tel: 01793 824780). Walkers can also stop off at the nearby Stanton House Hotel, which welcomes visitors for drinks and refreshments. The Swindon Rangers also regulary organise tours of the park, which is open 7 days a week. Kids can make some simple charcoal sticks and then explore the park for inspiration to create their own charcoal masterpiece to take home! Who's a good boy, then! Swindon nature: male swan takes a break from 24-hour guard - and gets a ticking off!.. 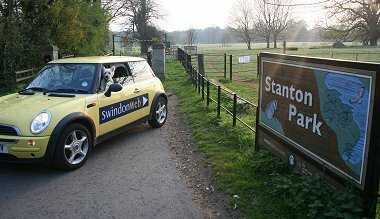 Stanton Park - more info.